As someone who is interested in Phoenix history, I've always been fascinated by the Westward Ho, which is on Central at Fillmore. It was built in 1928, and in its heyday was the height of luxury. Stories are told of celebrities, and mobsters, but that never really interested me. I'm interested in the architecture. It was built, at considerable expense, to attract the kind of people who could afford luxury. And when those people moved on to other places, the Westward Ho became just like any other old building in Phoenix, lost and neglected. The rich people had just lost interest. 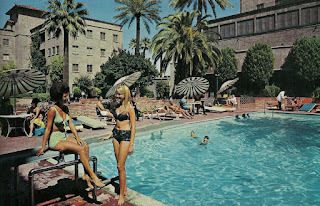 The pool at the Westward Ho in the 1960s, Central Avenue and Fillmore, Phoenix, Arizona. I visited the Westward Ho a couple of years ago, invited by one of the people who live in there now. It's now an apartment complex, especially for people who aren't rich. That is, affordable. And that means that the days of fancy cars pulling up to the front, with elegant women in mink coats are gone. The people who live there aren't the "elite" - far from it. 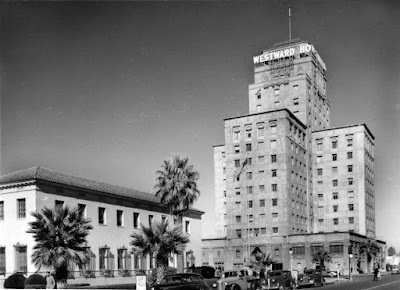 I really have no idea what the luxurious suites looked like in the heyday of the Westward Ho, but I'm sure that they aren't as small as the apartment that I looked at when I visited. There was barely room for a couch, in a narrow passage that had a tiny space for preparing food. I didn't look at the bedroom, but I'm sure that it wasn't gigantic and luxurious, either. The view out of window, however, is still just as spectacular as it's ever been. I like views out of windows! There was a time in my life when I lived in tiny spaces like I saw at the Westward Ho. They were affordable, and private. I had my own place - my own kitchen, my own bathroom, and that was nice, if not luxurious. I grew up in a crowded house, and I've always found that having my own space, no matter how tiny, was a luxury. Not how most people would see it, I know! Living in California taught me very clearly that the best things always went to the rich people. The poor people just had to do what they could. And that's the lesson about "affordability". When things get too expensive, the people who can't afford it just have to move on, and the rich people move in. I understand. I never got rich, and have to plans to do so, but I like the thought that if I needed to, there are places where I could live, like the Westward Ho, where I would feel safe, and welcomed. There's a dignity there that's hard to explain, but you can see if if you go there. Image at the top of this post: The Hotel Westward Ho in the 1930s, soon after it was built. It still looks pretty much the same today, but it's not exclusive to rich people anymore.